The magnificent doorway of Eglise St-Trophime in Place de la Republique, Arles in Provence, France in Europe. 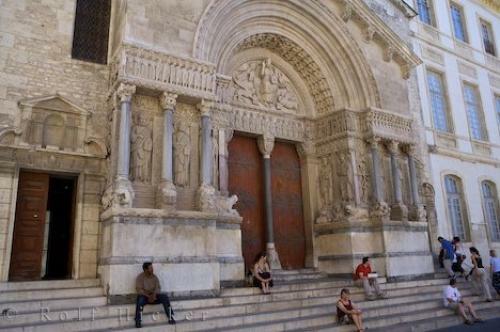 Photo of Eglise St-Trophime doorway in Arles, Provence in France, Europe. ... Eglise St-Trophime in Place de la Republique, Old Town, Arles, Bouches du Rhone, Provence, France, Europe. I photographed this photo with the digital SLR camera model Canon EOS-1Ds Mark II, aperture of f/6.3, exposure time of 1/80 sec. on ISO 100, as always I used a original Canon Lens, the focus lenght for this picture was 28mm.